Wi-Fi at the albergue was sketchy, so I used the desktop computer to find information on the Rome2Rio website about trains or buses heading north. 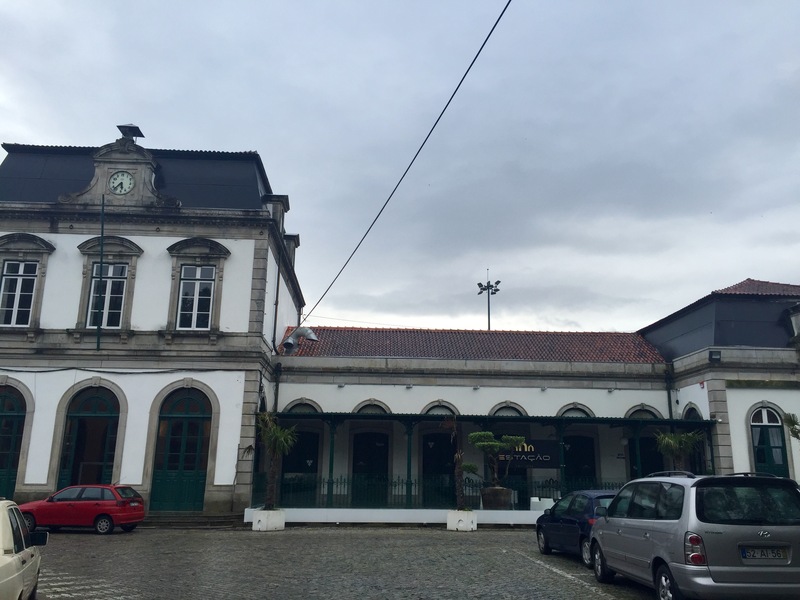 I found that there was a 10 o’clock train from Valença to Redondela, which would skip the rerouted O Porriño stage altogether. I Google-mapped the train station and saw that it was just a five minute walk from the albergue. At this point it wasn’t raining yet. When I got there to buy my ticket, the station agent told me it would leave at 11 o’clock. (Spain is one hour ahead of Portugal, so take note of schedules in Valença and Tui). Hooray! I now had enough time to find a place to eat breakfast. A few blocks from the train station was a cheap and cheerful café with fresh-squeezed orange juice and many different kinds of toast. 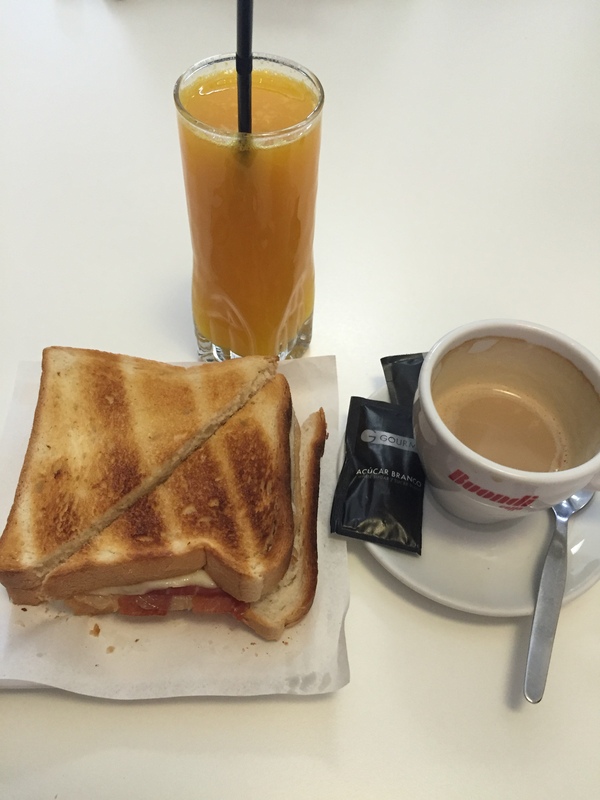 I got one with ham and cheese and, of course, a café con leche: a hearty breakfast for 5 euros and my last meal in Portugal. 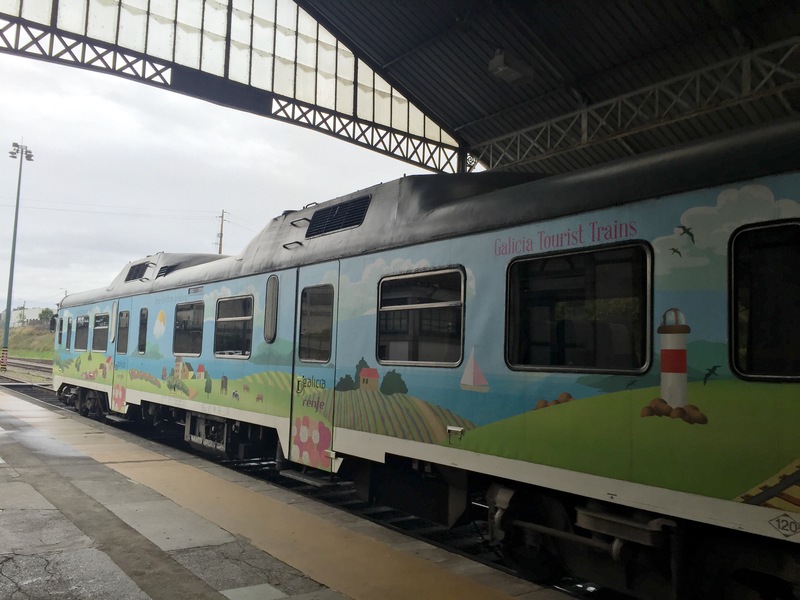 The Galicia tourist train was the most adorable train I’ve ever seen, and it cost only 4 euros! It was painted on the outside with colorful scenes of Galicia. I had the train all to myself for a few stops until some locals boarded. It was such a quick and pleasant ride that I almost missed getting off the train. I love trains, especially this one. I arrived at Redondela around noon, and even though it was still raining, I felt I had the energy and strength to walk a few hours. I figured I could stay at the halfway point, Arcade, a fishing village noted for having the best oysters in Galicia. At least I’d be walking out of a small village instead of a big concrete jungle that the O Porriño stage would have been. Locals and pilgrims taking cover in doorways probably thought I was crazy to head out in this heavy rain at noon (most pilgrims leave by 8 a.m., but I don’t move that fast in the morning). The Germans all have rain ponchos that cover their packs in heavy rain, but I like to use an umbrella. Since I don’t use trekking poles when I walk through small towns with narrow streets, my hands are free to hold the umbrella. There was a rather steep downhill slope paved with chunky square white stones, and I felt my feet slip at one point, but I was able to avoid falling, thank goodness! I remembered to walk slower when surfaces were wet and was grateful that I didn’t fall and break something. Camino arrows and shells that mark the way were sparse leaving Redondela. 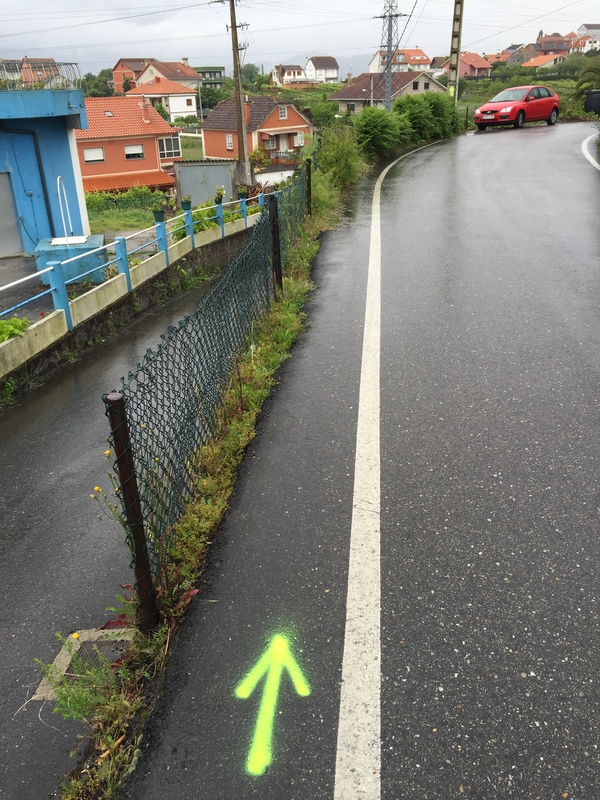 I used the Wise Pilgrim app, which explained the poor signage and said to trust the ugly spray-painted neon arrows. The Brierley and other books didn’t explain this. Thumbs up to Wise Pilgrim—it’s deserving of its name! Back to the nice stone way markers, but someone still spray-painted an arrow! Once I got out of town and into a forested area, the stone markers appeared again. The dirt path was wide and the climb gradual. I switched from holding my umbrella to holding my trekking poles, a trade-off for making the hill and dirt hikes easier. My cork visor and Columbia rain jacket were sufficient to keep me covered. It was actually perfect walking weather – not too hot or cold. The rain gradually decreased to a sprinkle as I got to the summit, where I saw this big rectangular structure in the distance. 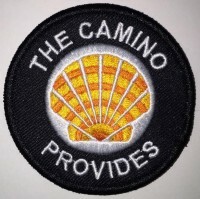 When I got closer, I saw that it was a big rack of Camino shells! 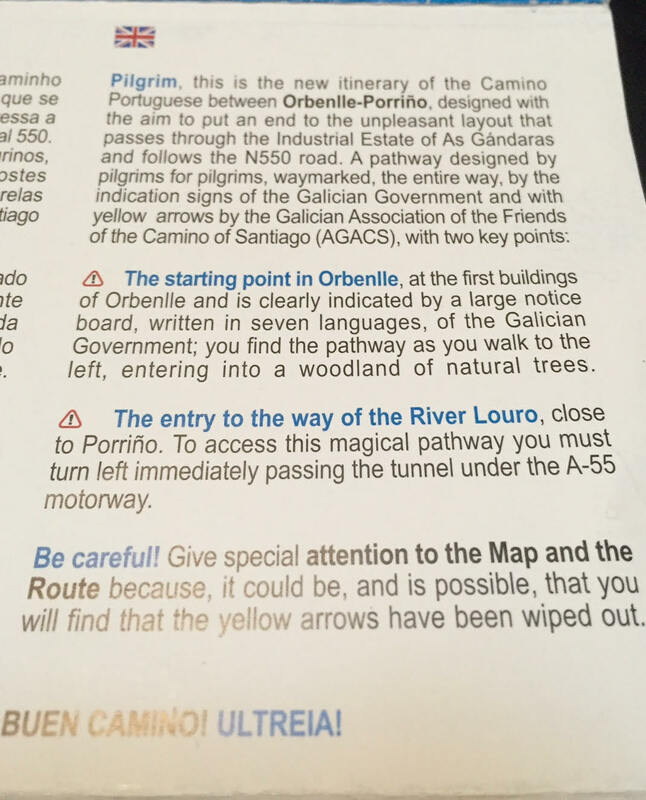 I recall seeing this, or something like it, in my Camino research but couldn’t remember if it was in a film, photo, or someone’s blog. Anyway, I read some of the shells and took a few photos. I’m glad I got to see this monument to the Camino. It made me think about all the pilgrims who walked before me. A little farther down the way there was an alcove of pilgrim paraphernalia at someone’s front gate. This is definitely Camino country! I didn’t see any other pilgrims on the Camino until much later in the day. I made it to Arcade around 1:30 p.m. and stopped in a modern-looking albergue to use their bathroom and Wi-Fi to check my messages. I met two women from South Africa there. One was nursing bad blisters and asked me to pray for her feet! We chatted for a while in what seemed to be a clean and comfortable albergue. The bunk beds were snug against the walls for more privacy. I was tempted to stay. Alas, the Camino was calling me to walk farther. 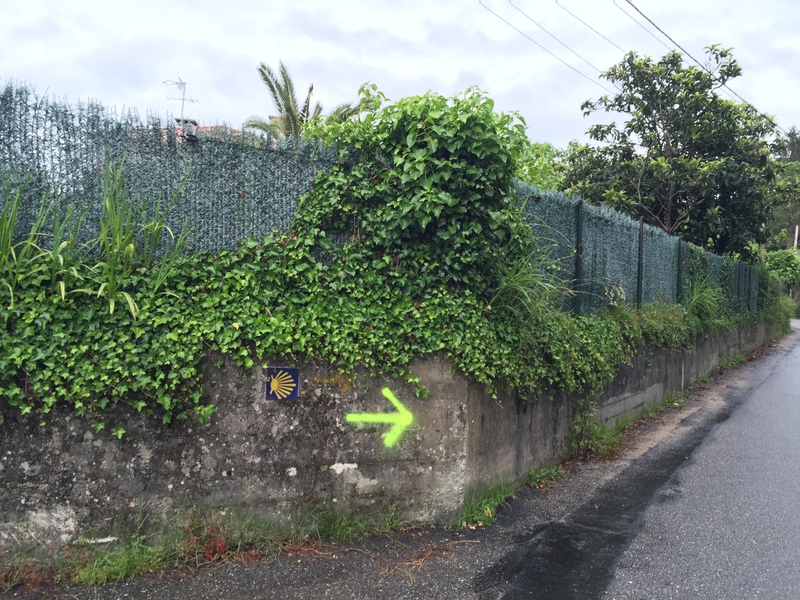 After an EmergenC drink, some almonds, and a Kind bar, I felt energized enough to walk on to Pontevedra. Arcade was the place of a historic battle in 1809 during the Peninsular War. Click here for more information. After leaving Arcade, the walk was amazing. There were waterfalls, big stone steps, ferns and foxgloves. 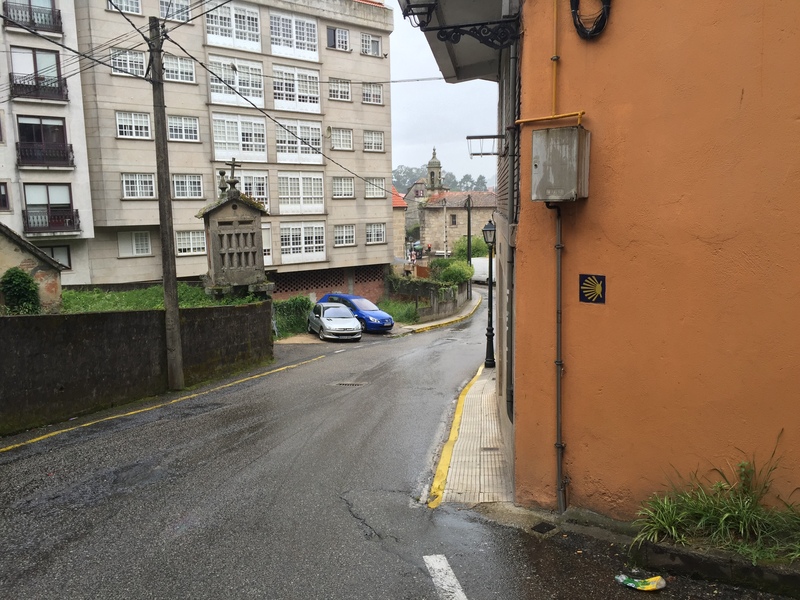 I learned to enjoy walking alone and to appreciate the rain, for it’s what makes Galicia so green and lush. I was wondering why I hadn’t seen other pilgrims for hours. Did they decide to not walk in the rain? Perhaps they all just got an earlier start. It was a little eerie, but oh so beautiful. Here are a few videos and photos. I finally saw two pilgrims ahead. One of them stopped to put on his rain poncho as it quickly started to pour again. I said, “Hola, buen Camino,” as I was happy to see some people. My enthusiasm to see other pilgrims wasn’t returned. I hate to say this, but they had really bad body odor, so I was relieved to pass them. I’ve heard that a drawback of the big rain ponchos is that your body can’t breathe under the tent-like plastic. They had probably been sweating under those things all day. Ick! We crossed paths a few times because I am a fast walker and I love to stop for photos when I see something beautiful, which is very often on the Camino! I was thinking about how the Germans seem a bit aloof. I know better than to stereotype, but I couldn’t help noticing how they mostly keep to themselves and seem to not want to talk to others. 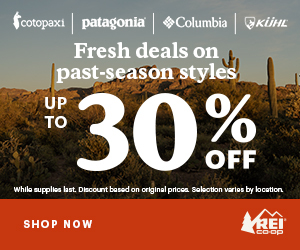 You can spot them a kilometer away with their Deuter backpacks and Leki trekking poles. 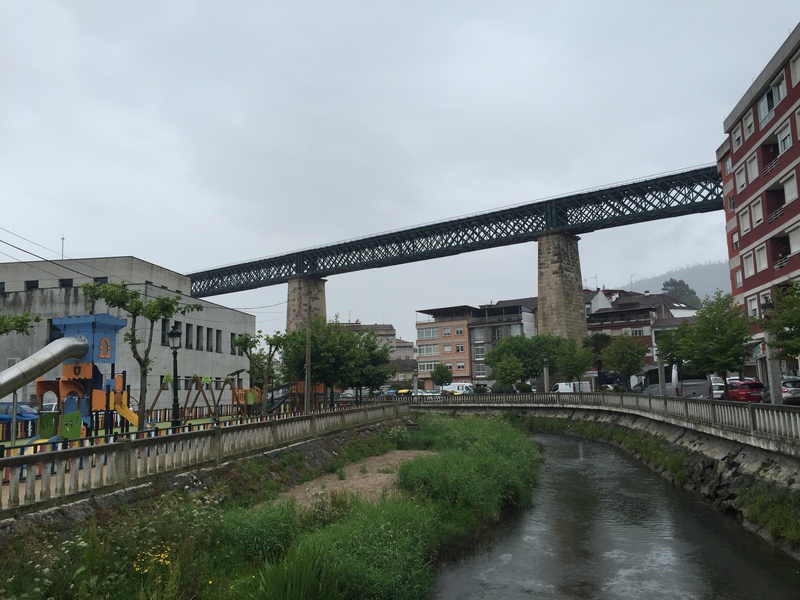 Later that day, as I got closer to Pontevedra, two German women were singing as they walked; a pleasant interruption and a reminder to not judge. I’m half German, after all; maybe getting to know my German brethren was to be part of my Camino. Over the next few days, I was to meet some fun and fabulous fräuleins, including my German doppelgänger. Up next, Pontevedra: A Peregrina Paradise. 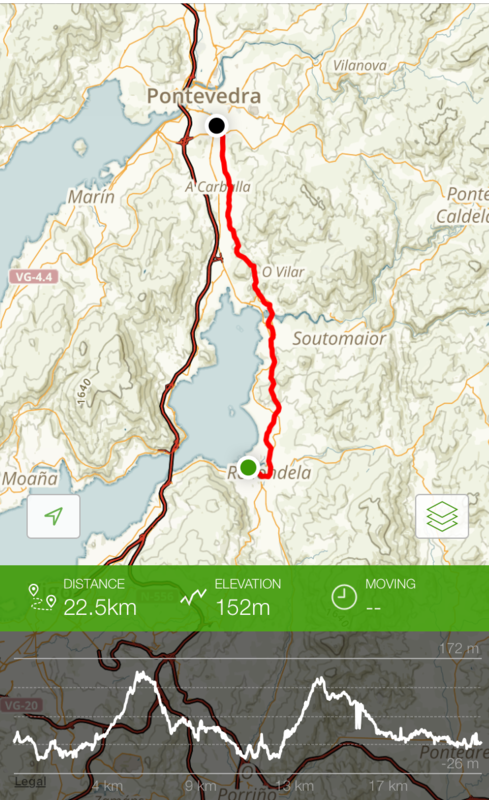 Hike Stats from AllTrails app – Redondela to Pontevedra. 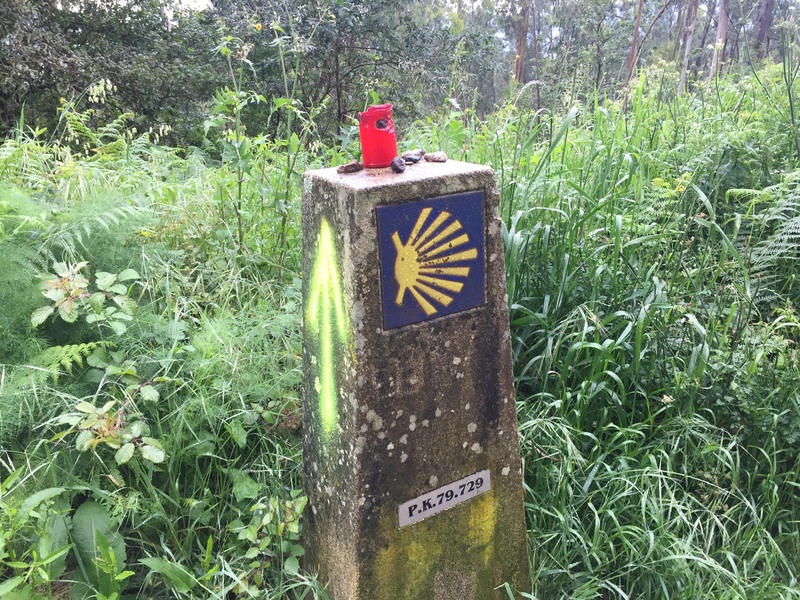 I love your Camino adventures!